The coating is a bottled product for chains that is applied in liquid form, and which hardens to a 100% dry chain coating. CeramicSpeed tells us that it generates less friction than any other chain lube on the market (being out-performed only by the factory-treated UFO Racing Chain). And as Friction Facts’ research (note Friction Facts is now a part of CeramicSpeed, as covered below) has so often concluded: every watt lost to friction is one less watt available to power the bike forwards. the world. 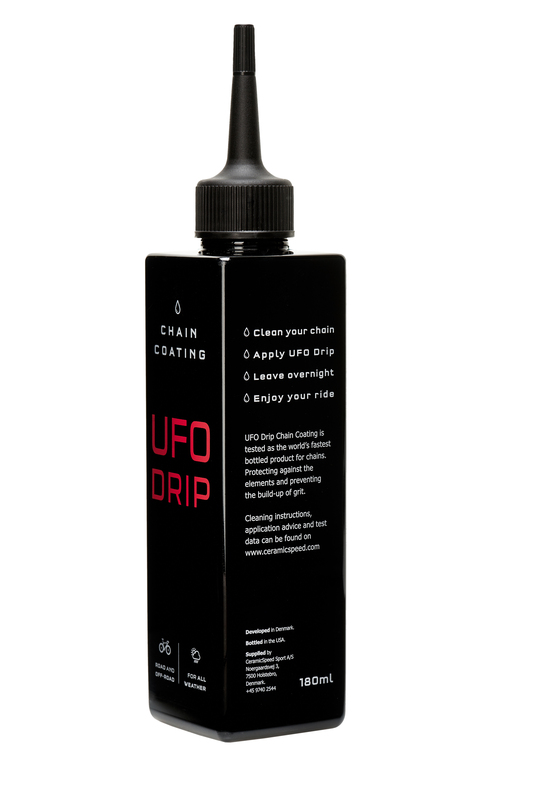 What makes the UFO Racing Chain unique , is a factory-applied chain coating. However, CeramicSpeed had more radical ambitions – they wanted to liberate UFO-like speed from the bespoke factory process, somehow bottle it, and put it in the hands of the people. 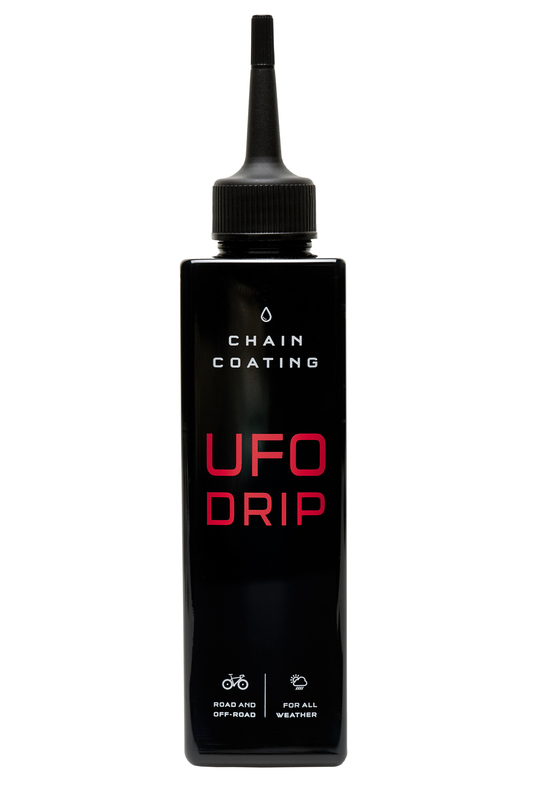 UFO Drip Chain Coating will be available as a 180ml bottle retailing at $75/70 EUR and will start shipping beginning of October. I didn’t know they bottle liquid gold knowthese days. Thats 1 hell of a price for lubrication. In Ceramicspeed’s own marketing they state that a UFO chain saves between 2 and 5 watts, and that this lube is not as good as the UFO chain, so actual saving may be between 1 and 4w. That’s nothing. Next question is how a product that saves a very small amount of power can be 83% better than the next best competitor. I don’t think the maths stacks up, and certainly doesn’t fit with friction facts chain tests which showed Squirt chain lube (under $10) to be close to a UFO chain. Some more critical thinking needed here aerogeeks please.